Purchase 5 QTY (125 Stickers) for 15% Discount. Purchase 10 QTY (250 Stickers) for a 30% Discount. Purchase 20 QTY (500 Stickers) for a 45% Discount. Discounts are applied during checkout. These stickers are designed for a marine environment using a high tack adhesive based vinyl made in the USA. The same process is used to make stickers for the Navy. We don't use the cheap imported 12 month outdoor rated inks or vinyls others may use. These should only be used to advertise real estate property for sale since most of these advertising boards are removed within 3 or 4 months. We only use printer brand Japanese made inks which have an outdoor rating of just over 30 months and a quality vinyl to suit. As a guide only stickers should last around 18-24 months if exposed outdoors 24/7 and around 30 months if your stickers are laminated. A design saved in pdf or eps format is needed that can be opened in Illustrator CS4. When you are finished placing your order just reply to the order email you receive with your design. Please note if you need something designed the design costs start at $45. 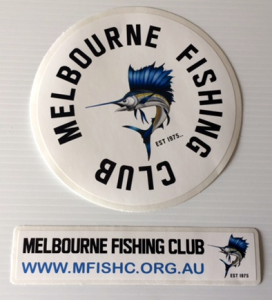 These stickers are perfect if you need a short run of stickers for your boat or if you want to promote and advertise any club or Business. Other sizes are available. Please contact us for more details.